During the second day of the Battle of Gettysburg, July 2, 1863, Gen. Robert E. Lee attempted to capitalize on his first day's success. He launched the Army of Northern Virginia in multiple attacks on the flanks of the Union Army of the Potomac, commanded by Maj. Gen. George G. Meade. After a short delay to assemble his forces and avoid detection in his approach march, Lt. Gen. James Longstreet attacked with his First Corps against the Union left flank. His division under Maj. Gen. John Bell Hood was formed along Warfield Ridge before it attacked Little Round Top and Devil's Den. To Hood's left along said ridge, Maj. Gen. Lafayette McLaws attacked the Wheatfield and the Peach Orchard. Although neither prevailed, the Union III Corps was effectively destroyed as a combat organization as it attempted to defend a salient over too wide a front. Gen. Meade rushed as many as 20,000 reinforcements from elsewhere in his line to resist these fierce assaults. The attacks in this sector concluded with an unsuccessful assault by the Third Corps division of Maj. Gen. Richard H. Anderson against the Union center on Cemetery Ridge. That evening, Confederate Second Corps commander Lt. Gen. Richard S. Ewell turned demonstrations against the Union right flank into full-scale assaults on Culp's Hill and East Cemetery Hill, but both were repulsed. The Union army had occupied strong defensive positions, and Meade handled his forces well, resulting in heavy losses for both sides but leaving the disposition of forces on both sides essentially unchanged. Lee's hope of crushing the Army of the Potomac on Northern territory was dashed, but undaunted, he began to plan for the third day of fighting. On the second day of the Battle of Gettysburg, Union forces defended a fishhook-shaped range of hills and ridges south of Gettysburg with some 90,000 soldiers. Confederate lines essentially wrapped around the Union position with 70,000 soldiers. On the afternoon of July 2, 1863, Gen. Robert E. Lee launched a heavy assault on the Union left flank, and fierce fighting raged at Devil's Den, Little Round Top, the Wheatfield, the Peach Orchard and Cemetery Ridge. On the Union right, demonstrations escalated into full-scale assaults on Culp's Hill and East Cemetery Hill. Although the Confederates gained ground, the Union defenders still held strong positions by the end of the day. Warfield Ridge, which would host two Confederate divisions on the second day of battle, is actually the southern extension of Seminary Ridge south of Pitzer Woods and the Millerstown Road. The gentle ridge veers in a southeasterly direction where it is intersected by the Emmitsburg Road. This ridge was heavily wooded at the time of the battle and provided excellent concealment for Longstreet's Confederate troops who sheltered here prior to the attack on the afternoon of July 2. The trees screened the Southern line of march from any Union vantage point, including that of the signalmen on Little Round Top. The last troops into line were also the first to step off toward the Union left flank from this point. Brig. Gen. Evander Law's Alabama brigade of Maj. Gen. John Bell Hood's Division marched over 18 miles to get to this point and then began the attack at 4 o'clock without the benefit of water. Thirsty soldiers handed over their empty canteens to several men who were detailed to find a well and fill them, but they had not returned before the attack began. (The canteen detail never did return; all were captured with the filled canteens while attempting to locate their comrades.) The lack of water would play a major role in fatigue and exhaustion during the ensuing fight. 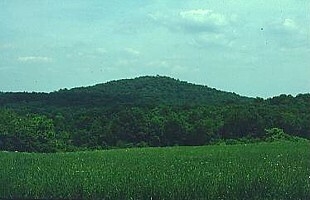 (Right) Big Round Top from Warfield Ridge. Hood believed that the heavily wooded hill could conceal his march around and into the Union rear. Photo Gettysburg NMP. Maj. Gen. John Bell Hood was the division commander for the Rebel soldiers here. Brave and audacious, Hood was uneasy with the assignment given him especially after he surveyed the ground east of Warfield Ridge. Union signalmen on top of Little Round Top could easily see his troops and Yankee batteries at Devil's Den and the Peach Orchard had a clear field of fire on his formations. Supporting Confederate batteries on Warfield Ridge were not enough to suppress the Union artillery and his soldiers had no chance to defend themselves until they closed on the enemy positions. Hood encountered Lt. Gen. Longstreet and proposed a change of plans- he would move his division further south around Big Round Top and attack behind the Union line to throw the Union guns off Devil's Den from the rear. Hot and frustrated by a day full of delays, a stubborn Longstreet replied that Gen. Lee's orders to attack up the Emmitsburg Road had to be carried out as ordered. Hood protested. Again Longstreet stated, "We must obey the orders of Gen. Lee." Hood turned to rejoin his troops as Longstreet rode to meet with his other division commander, Maj. Gen. McLaws. Moments after this encounter, Hood was seriously wounded near this location and carried from the field. Brig. Gen. Evander Law stepped into his place and directed the division for the remainder of the battle. The loss of Hood was keenly felt; Law had no idea of the route of attack Gen. Lee had ordered. "We advanced to the attack," wrote Brig. Gen. Evander Law, "The artillery on both sides had been warmly engaged for about fifteen minutes and continued to fire heavily until we became engaged with the Federal infantry..." Overlooking the assault were Union signal men stationed on Little Round Top. Law knew the importance of the hill and of the adjacent Big Round Top, which "rose like a huge sentinel guarding the Federal left flank." The opening charge was directed against Union troops occupying Devil's Den. But Law's brigade, now commanded by Colonel William C. Oates of the 15th Alabama Infantry, was forced to move further to the right toward Big Round Top to escape the concentrated fire coming from Union artillery at Devil's Den, the Wheatfield and the Peach Orchard. (Right) Photo of Little Round Top from Warfield Ridge. 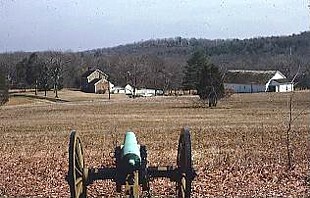 Hood's men had to march across the Bushman Farm (foreground) under fire from Union artillery to reach Devil's Den. Gettysburg NMP. The Southerners rushed over farm fields scattered with large boulders and dense thickets, divided by stout rail and stone fences. US Sharpshooters peppered the Southern ranks with a deadly fusillade but the Confederates kept moving. Law's brigade split in half, one portion headed to flank the Union guns at Devil's Den and the other to strike Little Round Top. Instead of flanking Devil's Den, Law's left half was met by Union troops rushed into the small valley to stem the attack. Adjacent to Law's brigade, Robertson's Texas Brigade also moved swiftly down the slope of Warfield Ridge through the Bushman Farm and charged the Union battery posted on top of Devil's Den, applying deadly pressure to the New York artillerymen from front and flank. Law's right wing continued northward. His right regiment, the 15th Alabama, marched over the summit of Big Round Top before running straight into a Union brigade posted on the southern slope of Little Round Top. The Bushman and Slyder Farms that lie between Warfield Ridge and Big Round Top are more heavily wooded today than in 1863. Both farms were small family operations and the farmers had cleared trees from most of the area up to the slopes of Big Round Top for pasture and crops. Every inch of land here was precious as the soil was not of the same good quality as those farms north of Devil's Den. Since that time, the land has been constantly farmed and used for purposes other than remaining as open fields as in 1863. Gettysburg National Military Park's approved 1999 General Management Plan included a proposal to rehabilitate and restore this farmland to its pre-1920s appearance. Tree removal and land reclamation began in the winter of 2002-2003 and has been very successful, returning the area to its historic appearance and field patterns. Visitors can now appreciate the open terrain and distance Southern troops had to cross to get into the fighting. "They held the right wing of Lee's valiant host..."
On the southern tip of Warfield Ridge stands the Alabama Monument, that state's tribute to the Alabamians who served at Gettysburg. 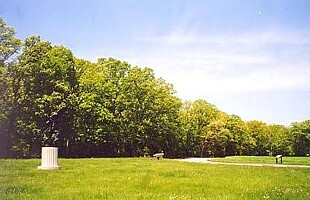 It was from this location that Law's brigade of Alabama regiments initiated Longstreet's attack against Devil's Den and Little Round Top on the second day of the battle. A central female figure represents the state of Alabama and signifies pride in her native sons kneeling beside her, as she points in the direction they must go. A wounded soldier passes his cartridge box to the figure of "Determination" who will continue into battle despite the odds. Set on a base of Vermont Granite and surrounded by a flagstone terrace and walk, this handsome monument cost the state of Alabama $12,000 to erect. The design and sculpture is the work of artist Joseph W. Urner of Frederick, Maryland. 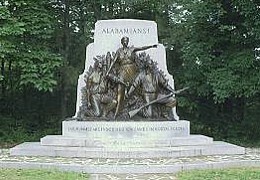 It was dedicated by the Alabama Division of the United Daughters of the Confederacy on November 12, 1933. Gen. Robert E. Lee had planned an assault against Union positions on the afternoon of July 2, but was delayed, however, because Lt. Gen. James Longstreet had to wait for his final brigade (Evander M. Law's, Hood's division) to arrive, and then he was forced to march on a long, circuitous route that could not be seen by Union Army Signal Corps observers on Little Round Top. It was 4 p.m. by the time his two divisions reached their jumping off points, and then he and his generals were astonished to find the III Corps planted directly in front of them on the Emmitsburg Road. Hood, arguing with Longstreet, insisted that the development demanded a change in tactics. He wanted to swing around, below and behind, Round Top and hit the Union Army in the rear, but Longstreet refused to consider such a modification to Lee's order. Nevertheless, and partly because of Sickles' unexpected location, Longstreet's assault would not proceed according to Lee's plan. 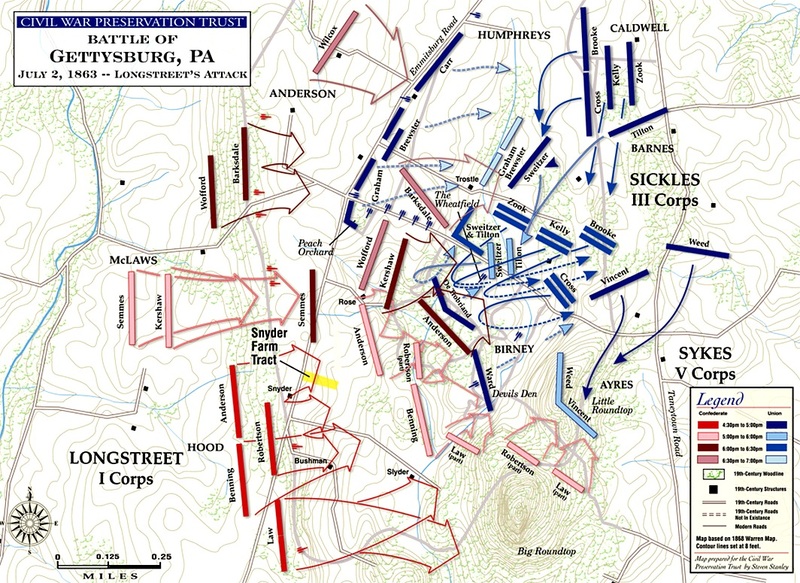 Instead of wheeling left to join a simultaneous two-division push on either side of the Emmitsburg Road, Hood's division attacked in a more easterly direction than intended, and McLaws' and Anderson's divisions deployed brigade by brigade, in an en echelon style of attack, also heading more to the east than the intended northeast. Lee's inability to coordinate his units would result in a series of disjointed attacks on the 2nd day of fighting. Underestimating Meade's strength, poor logistics, including the lack of sufficient drinking water, and inadequate reserves would contribute to the high casualties in the Southern ranks on this day. 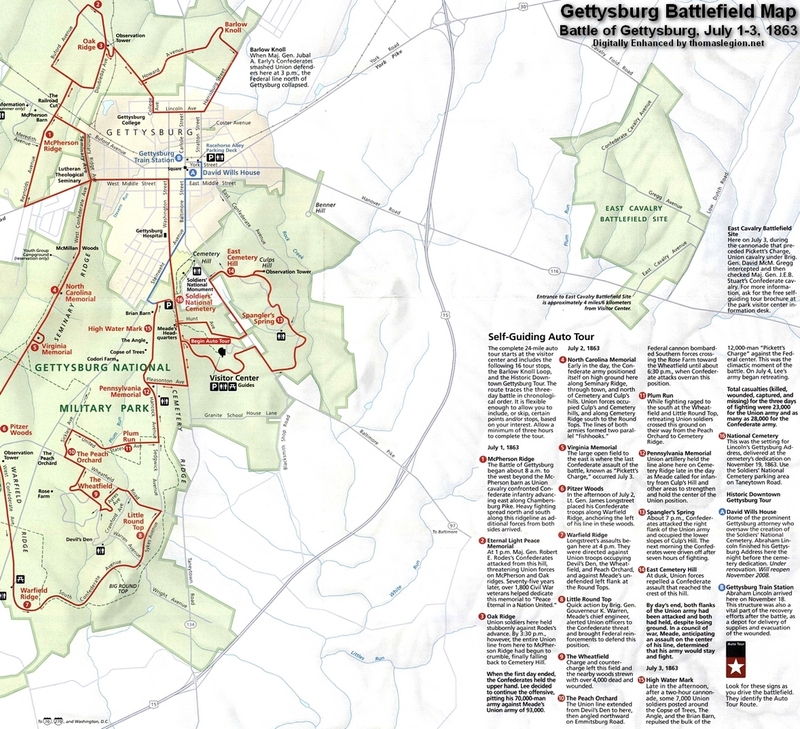 Lee's refusal and failure to avoid Union strongpoints would continue through the 3rd and final day at Gettysburg. According to Sun Tzu, when the enemy is strong avoid him, and where he is weak, attack him. While Lee committed many blunders by pushing his grand army into Pennsylvania, he could ill-afford the tremendous, irreplaceable casualties that occurred here. His battered and demoralized army would now crawl back to Virginia, only to never invade Northern soil again. Meanwhile, fresh troops continued to fill and replenish the ranks of the Army of the Potomac. Casualty figures for the second day of Gettysburg are difficult to ascertain because both armies reported by unit after the full battle, not by day. One estimate is that the Confederates lost approximately 6,000 killed, missing, or wounded from Hood's, McLaws', and Anderson's divisions, amounting to 30–40% casualties. Union losses in these actions probably exceeded 9,000. One estimate for the day's total (including the Culp's and Cemetery Hill actions) show 10,000 Union and 6,800 Confederate casualties. This is in comparison to approximately 9,000 Union and 6,000 Confederate casualties on the first day, although there were much larger percentages of both armies engaged on the second day. Some estimates of total casualties for the day run as high as 20,000 and declare it the bloodiest day of the Battle of Gettysburg. It is, notwithstanding, a testament to the ferocity of the day's battle that such high casualties figures resulted even with much of the fighting not occurring until late in the afternoon and thereafter lasting about six hours. By comparison, the Battle of Antietam—known famously as the bloodiest single day in American military history with nearly 23,000 casualties—was an engagement that lasted twelve hours, or about twice as long. Sources: National Park Service; Gettysburg National Military Park; Official Records of the Union and Confederate Armies; Civil War Trust.